Leon Kolankiewicz is a wildlife biologist and consulting environmental planner. Reducing current immigration levels is a necessary part of working toward sustainability in the United States. — Population and Consumption Task Force, President's Council on Sustainable Development, 1996. Environmentalists have long recognized the impact of human population growth on the environment. Both common sense and a large body of research make clear that the number of people living in a given land area has significant implications for the environment. This fact does not mean that human beings are plague on the land. Nor does it mean that per capita consumption of resources does not matter. What it does mean is that a sound approach to protecting the environment nationally or internationally must recognize the importance of population size and growth. As this paper shows, in many cases per capita reductions in resource use or environmental impact are offset, sometimes entirely, by population increase. Choosing to ignore the implications of population for the environment in the United States will make it much more difficult to effectively protect it. This paper also demonstrates the importance of population growth to the environment, particularly in the United States. Since the early 1970s American women have chosen to have about two children on average — roughly the number necessary to maintain the size of the U.S. population. However, federal immigration programs have added significantly to the American population by bringing in over a million legal immigrants annually and tolerating widespread illegal immigration. Of course, immigrants and their descendants are not fundamentally different from natives in their environmental impact. But legal immigration levels are set by elected officials, as is the level of effort devoted to controlling illegal immigration. High levels of immigration have added significantly to the number of human beings living in the United States, and this has environmental consequences. Census Bureau projections released in December 2012 confirm that despite somewhat lower levels of immigration in recent years, absent a change in immigration policy, the United States will grow by over 100 million people to a population of 420 million by 2060. Future immigration is expected to account for about three-fourths of the increase. That is, immigrants who have not yet arrived, but who will if policy is not changed, will account for the overwhelming majority of future population increase. If American environmentalists decide to do nothing to prevent this growth from happening — either because they think it is inevitable or because they are too focused on more immediate environmental threats, or because they fear alienating their liberal political allies — they should at least acknowledge the tradeoff such a decision implies. If stabilizing the U.S. population is a lost cause, safeguarding the American environment may be as well. At the most basic level, biologists classify all living organisms by ecological function into two groups: 1) producers, or plants, and 2) consumers, or animals. All consumers, including all humans, extract low-entropy matter and energy from environmental sources and excrete wastes into environmental "sinks". In so doing, each and every human being exerts a tangible load on his or her biophysical milieu. Cumulatively, over the course of a typical human lifetime, the sheer quantities of resources consumed and wastes generated are staggering, especially in wealthier, developed societies like our own. For example, from birth to death, the average American uses over 1,400 tons of newly mined minerals.1 Consuming resources and discarding the ensuing wastes entail a myriad of environmental consequences or impacts. This then is why the number of human beings — our population size — matters. It is why population size and growth rates matter, or should matter, to ecologists — scientists who study living systems, or ecosystems — and environmentalists — citizens concerned about the environment. The "environment" includes pretty much everything under the sun, both natural and manmade. It is not only clean air and water, the climate, soils, forests, wetlands, wilderness, and wildlife; it is also croplands and rangelands, open pit mines, and the "built environment" — human settlements from historic villages to modern mega-cities, cultural monuments, and glistening or tottering infrastructure — as well as such intangibles as the "quality of life". Four million Americans were counted at the time of the first Census in 1790, most of them huddled along the Eastern Seaboard. That modest number has undergone six doublings, adding about 316 million of us to those initial four million, and we are well on our way to a seventh doubling sometime between 2050 and 2100. The stunning transformation of a continent's virgin forests, prairies, mountains and rivers into the most prosperous and powerful nation in history is a shining success story, but one that has come at an environmental cost. The impact on America's natural environment has been significant and, in some ways, permanent and irrevocable. Much of the transformation and exploitation of the American landscape occurred simply due to the skyrocketing needs and demands of an explosive increase in the number of Americans. The U.S. population quadrupled from 1900 to 2010. Over time, this growth has been driven at different times by high immigration rates, high birth rates, or both. It has also been driven by the long-term decline in death rates (increasing longevity) that all developed and developing countries have experienced and welcomed. At times immigration has been the dominant factor in U.S. population growth; at times high birth rates have been more important. When the U.S. population grew by 28 million in the 1950s "baby boom" era, high birth rates drove almost all of that growth. However, birth rates decreased sharply from the 1950s to the 1970s, even as immigration rates began to soar, partly as a result of the Immigration and Naturalization Act (Hart-Celler Act) of 1965. By the 1990s and 2000s, depending on the methodology used, immigration directly and indirectly accounted for about 60 to 80 percent of American population growth. And at least numerically this growth reached levels never before seen: Between 1990 and 2000 some 32 million more Americans were added to the population — the largest increment of any decade in our history — and in the 2000-2010 period, an additional 27 million joined our ranks — the third-most of any decade.4 Immigration will continue to exercise a dominant role for the foreseeable future. In December 2012 the Census Bureau released population projections that reflected a downturn in immigration levels, particularly illegal immigration, that has been well documented.5 Nevertheless, the Bureau's new projections show that the U.S. population will grow from 309.3 million in 2010 to 420.3 million in 2060 — a 111 million increase. Based on these new projections as well as prior research, an estimated 82 million (74 percent) of population growth will come from future immigration.6 And this estimate assumes a historically low level of immigration. If immigration turns out to be higher than the Census Bureau assumes in its newest projections, then it will add more than 82 million new residents to the U.S. population. As noted in a Center for Immigration Studies Backgrounder7, immigration's preponderant role in driving American population growth has not been at the center of the nation's immigration debate, in spite of the fact that increasing the nation's total population is one of immigration's clearest and most direct effects on the country. Neither has it been a focus of concerted environmentalist angst or advocacy, in spite the spirited activism of a few diehard population activists, and regardless of the fact that, as noted above, population growth has important implications for environmental degradation, congestion, habitat and species loss, and resource depletion, even as it thwarts the pursuit of sustainability. As discussed above, the Census Bureau projects that the U.S. population will grow by 111 million between 2010 and 2060 with future immigration accounting for the overwhelming majority of future population increase. If this immigration and subsequent population growth occur, the consequences for the American environment will almost certainly be starkly negative. Even if American environmentalists decide to do nothing to prevent this growth from happening — either because they think it is inevitable or because they are too focused on more immediate environmental threats, or because they fear alienating their liberal political allies — they should at least acknowledge the tradeoff such a decision implies. If stabilizing the U.S. population is a lost cause, safeguarding the American environment may be as well. "It's tough to make predictions, especially about the future", baseball great and homespun sage Yogi Berra once said. And the further into the future one peers, the tougher it gets. Demographers themselves are wary of making projections much beyond 50 years because they have learned the hard way that the longer the time frame, the greater the likelihood of one or more unanticipated phenomena making hash of the careful assumptions upon which their deceptively precise projections rest. Making predictions of future environmental trends, impacts, and conditions is even more fraught with risk because, 1) natural systems are highly complex and often behave in a counterintuitive or nonlinear manner; our understanding of nature is incomplete and constantly evolving, and 2) the human factor — both technological and social — is a continually moving target. One thing we do know about both natural and human systems is that both are capable of sudden, unexpected change, as well as gradual change, stasis, inertia, and lags. Natural scientists use terminology such as "discontinuity", "tipping point", "state shift", and "phase shift" — some of which have entered the vernacular — to describe the precise moment when a system undergoes an abrupt change from one state to another. Sometimes these sudden shifts are reversible — as when water evaporates into a gas only to condense again into a liquid — sometime not, as with extinctions. Sometimes they produce new stable states, sometimes instability or chaos reign. In the social sciences, scholar Nassim Nicholas Taleb has coined the expression "black swan" as a metaphor of rare, unforeseen events with outsized, disruptive effects on history, politics, finance, science, and technology.8 The straw that broke the camel's back was a black swan. The predictions of ecologists, other scientists, and environmentalists as to the future state of the world are like snowflakes — infinite in variety. No two are exactly alike. In 2012, in the prestigious British scientific journal Nature, a distinguished team of scientists from the United States, Canada, South America, and Europe warned that human population growth, extensive degradation and destruction of natural ecosystems, and climate change may be driving our biosphere toward an irreversible change, which they called "a planet-wide tipping point".12 The Association for the Study of Peak Oil and Gas (ASPO) warns of potentially severe economic, environmental, and social disruptions related to what they believe to be the imminent peaking of worldwide conventional petroleum production.13 Many climate scientists and advocacy groups assert that climate change will become increasingly disruptive to weather, agriculture, ecosystems, and the economy.14 Author Chris Clugston in his 2012 book Scarcity argues that ever-increasing global scarcity of scores of non-renewable natural resources threatens a "new normal" of geologically imposed austerity.15 Trend forecaster and best-selling author Chris Martenson offers "insights for prospering as our world changes",16 while the Post Carbon Institute claims that economic growth is all but over and touts itself as "leading the transition to a more resilient, equitable, and sustainable world".17 None of these believe that "business as usual" can prevail to the year 2060. However, the predictions of this Backgrounder, to a large extent, do assume business-as-usual trends extrapolated and projected to 2060. The reason is that any predictions at all become all but impossible if one attempts to incorporate all of the possible game changers and black swans that may well swoop out of the sky and intervene between now and 2060, casting the United States and the world in a different direction … or into an alternative dimension entirely. It is also an exercise in futility to try to guess what the odds are between the different possible fates that await us. In attempting to quantify environmental effects, this Backgrounder does not merely assume that each and every numerical increase in population has an exact proportionally greater effect on the resource or environmental attribute in question. In recent decades, substantial strides have been made in reducing the energy, resource, and water intensity of our economy. That is, it takes less energy and less water to generate a given dollar of GDP as a result of improved energy and water efficiency. Average per capita energy and water consumption have also declined modestly over the last several decades, even as per capita income has grown, as a result of higher prices, incentives, both institutional and individual conservation efforts, and implementation of energy and water efficient technologies. Likewise, per capita land consumption has been declining in the last several years (in contrast to decades-long trends before that), as younger Americans appear to be opting for higher-density living, partly in response to economic pressures associated with higher gasoline and overall energy costs (shorter commutes and smaller, attached homes entail less energy use and expense). The net effect of these improvements is not to eliminate entirely, but to reduce the marginal impact on the environment of each added increment of population. In some instances, this reduction is sufficient to offset, or almost offset, the added environmental load represented by a growing population. In other instances, population growth is of such a magnitude that it overwhelms the offsetting influence of conservation and efficiency measures. But whether population growth simply offsets reductions in per capita environmental impacts or adds to it, the fact remains that population increase makes the environment worse off than it otherwise would have been had it not occurred. The degree of traffic congestion on American streets is a function of the populations of people and vehicles in comparison to roadway capacity. In recent decades, as urban populations and vehicle-miles-traveled (VMT to transportation planners) have grown faster than roadway capacity, congestion has worsened considerably. More and more motorists sit for longer and longer hours in gridlocked traffic breathing one another's fumes. 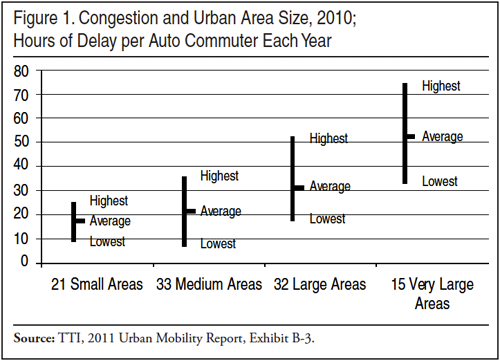 Not surprisingly, traffic congestion is worse in larger urban areas than in smaller ones. Figure 1 displays this relationship. It is not unreasonable then, to assert that as the populations of cities and suburban areas grow, on the average about 36 percent by 2060, traffic congestion will worsen substantially. Washington, D.C., metro area motorists, who even now waste more than 70 hours every year sitting in traffic, may likely to find themselves idling for 100 hours a year by 2060 if population grow continues, even with ongoing and foreseeable transportation improvements. A 36 percent increase in population does not necessarily equal a 36 percent increase in VMT for a variety of reasons. For example, more people can hypothetically opt to use public transit (e.g., buses, subways, light rail), although recent experience has provided little evidence of this. And a 36 percent increase in VMT does not necessarily signify a 36 percent increase in congestion and wasted time. Roadway capacity can expand at a faster pace, provided public or private funding to construct and maintain such capacity is available, less and less a sure proposition in this day and age of fiscal constraints and limited capital. Other possible game changers are driverless car technology under development by Google, which would reduce congestion by allowing vehicles to safely travel in a more compact fashion (closer together), and increases in gasoline prices, which could reduce congestion by reducing the number of cars on the road because driving has gotten far more expensive. On the other hand, some roads operating at capacity now may be pushed over the tipping point by further population increases and become chronically congested. The funds or space to improve such roads may be limited or not available. In these cases even a modest number of new drivers could result in significant increases in traffic congestion and wait times. Federal, state, and local governments as well as the private sector will surely respond to increased population density. In fact, they have. But these responses have not prevented traffic congestion from growing worse. It seems almost certain that adding 111 million people to the U.S. population over the next half century will worsen our already overcrowded roads and freeways. Energy is vital because it keeps the economy running. Energy production and consumption each entail significant environmental repercussions ranging from oil spills and air pollution to nuclear power plant risks and nuclear waste disposal. Although so-called green or renewable energy sources have certain advantages, they are not environmental panaceas. Wind farms can cause bird and bat mortality, generate objectionable noise and other issues for nearby residents, interfere with radar at airports, as well as mar unspoiled mountain or coastal scenery. Centralized solar energy facilities in Southwestern deserts obliterate habitats and wildlife in those areas. Hydroelectric dams destroy runs of anadromous fish like salmon and shad. Thus, the rate of annual energy consumption is a key index of environmental stresses even when that energy is produced by renewable sources. Americans are heavy energy users, among the highest per capita users on Earth and second only to colossal China in aggregate energy consumption. Moreover, both domestic and global energy consumption rates can be seen as unsustainable in the long run because some 85 percent of primary energy derives from non-renewable fossil fuels, which, when burned, are used up irrevocably and not replaced, leading to their inexorable depletion. If per capita energy consumption were to remain unchanged, increasing America's population 36 percent by 2060 would increase energy consumption and its environmental impacts by roughly 36 percent as well. 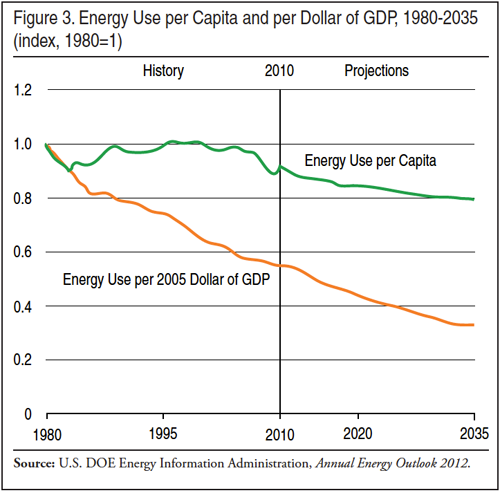 Fortunately, per capita energy use has decreased slightly in recent decades and is projected to continue this downward trend for the foreseeable future; by 2035, the U.S. Energy Information Administration (EIA) projects that energy use per capita will only be 80 percent of what it was 55 years earlier in 1980, or about a 12 percent decrease from 2010.20 Likewise, energy use per dollar of GDP will only be about a third of what it was 55 years earlier (Figure 3), a function both of energy efficiency improvements and structural changes in the U.S. economy (such as shifting energy-intensive industries overseas and moving more toward a "post-industrial" and information-based economy). If U.S. population were to remain constant, a 12 percent decline in per capita energy use would result in a 12 percent reduction in aggregate energy use, not exactly a cause for celebration but at least a solid step in the right direction. However, because our population is projected to grow by 36 percent instead, the net result would be a 20 percent increase in the annual rate of aggregate energy use. How will we meet this demand for energy? A nuclear "renaissance" appears increasingly uncertain after the costly 2011 nuclear disaster and partial core meltdown at the Fukushima Daiichi plant in Japan, and there is very little scope for additional hydroelectric output from America's rivers, especially in light of the concerns about the impact dams have on the ecosystem. Capital-intensive and expensive renewable solar and wind projects are likely to expand exponentially with government support (such as feed-in tariffs and statewide renewable energy standards) — and, at the same time, face stiffer headwinds and opposition as sensitive and valued landscapes and "seascapes" like Nantucket Sound near Martha's Vineyard in Massachusetts (where the battle over the Cape Wind project has been waged for a decade) are increasingly threatened with development. — Lewis Carroll, Through the Looking-Glass, 1871. Cumulatively, since the first commercial well was drilled at Titusville, Pa., in 1858, America has already drilled far more wells and extracted far more oil than any country on earth. Just since 1950, more than 2.6 million oil and natural gas wells have been drilled in the United States.21 In recent years there have been more than 820,000 producing oil and gas wells in operation at any given time.22 In 2010, over 36,000 new exploratory and development oil and gas wells were started, drilling a combined total of 239,247,000 feet (45,312 miles) in search of recoverable hydrocarbons. Figure 4 shows the jump in the number of rotary drill rigs (which bore the well holes) from 2009 to 2012 in response to higher crude oil prices up until 2008. It requires more and more effort, energy, and money to obtain a diminishing quantity of fossil fuels, in a perfect illustration of what economists call the law of diminishing marginal returns. As energy analyst Chris Nelder emphasizes: "Over the past century, world energy production has moved progressively from high quality resources with high production rates and low costs to lower quality resources with lower production rates and higher costs, and that progression is accelerating. "23 Put simply, we have already harvested the "low-hanging fruit." In trying to obtain what remains, it seem very likely that it will cost us increasingly more both in our wallets and in terms of damage to cherished environments — fragmented wildlife habitat, threatened aquifers, loss of tranquility in the countryside for many rural residents, localized air and water pollution, blighted scenery, heavy truck traffic on erstwhile quiet country roads, and so forth. As America's growing energy needs — driven entirely now by population growth, not rising per capita consumption — become more difficult to meet in the face of depletion and greater global competition for remaining supplies of fossil fuels from developing countries, the political pressure to open up public lands such as the Arctic National Wildlife Refuge (ANWR) in northern Alaska will only grow. Just as there is considerable pressure now to construct the Keystone XL pipeline to carrying syncrude from the Athabasca tar sands in the Canadian province of Alberta to refineries in Port Arthur, Texas, there may also be a concerted push to finally exploit in earnest the hypothetically vast quantities of oil resources in the oil shale (actually kerogen) of the Green River Formation in Utah, Colorado, and Wyoming. An estimated three trillion barrels of oil resources are found here,24 more than the entire quantity of conventional oil left on earth. However, the operative word is "hypothetical," for while these resources have been known for well over a century, they have always been and may always be a resource of the "future". Their time may never come. Their EROEI (energy return on energy invested) appears to be very low. That is, producing a barrel of oil from kerogen may take almost an equivalent amount of energy in some form. Furthermore, processing would require large amounts of water in an arid region, and land surface reclamation would be difficult.25 Moreover, the low EROEI and the vast quantities of oil shale in combination would pose a serious threat to the climate due to enormous carbon dioxide emissions. These are just a few of the energy-environment issues raised by U.S. population growth, which, as we have seen, is driven by immigration policy. In sum, the environmental implications of the Census Bureau's population projections for the United States raise important concerns for the environment that cannot be ignored. Water is essential to all life; both economies and ecosystems wither without it. The United States is comparatively well endowed with water resources and uses prodigious volumes of both surface water (withdrawn from reservoirs and rivers) and groundwater (pumped from subterranean aquifers) in agriculture, industry, and municipalities. In 2005, about 410,000 million gallons of water was withdrawn for use in the United States every day — over four million swimming pools' worth or about 5,000 Rose Bowls filled to the rim. About 80 percent of our water supply is from surface water and the remaining 20 percent from groundwater.26 Water is used to irrigate our crops, to manufacture all manner of products ranging from steel to silicon chips to soft drinks, to water our lawns, fill our cooking pots, wash away our wastes, and even to cool our thermal power plants. About 80 percent of water is used in U.S. agriculture,27 which is very water-intensive because crops (like all plants) need it for photosynthesis and transpiration. Protecting water quality by avoiding and cleaning up water pollution is as important as managing and conserving water quantity. Both aquatic and terrestrial ecosystems depend on water of adequate quantity and quality as well. It is obvious that freshwater fish, shellfish (clams, mussels, crayfish, etc.) and aquatic plants need water of sufficient depth, flow, clarity, and temperature to survive, and unpolluted, well-oxygenated water at that, but it is less obvious that adjacent riparian plant communities, wetlands, and many species of wildlife are equally dependent on the water coursing through streams and rivers. In taking water from natural environments for human use, it is important to leave enough water behind for ecosystem services and functions. And these functions not only include supporting fisheries and wildlife, but commercial navigation, hydroelectric generation, recreation (e.g., boating, fishing, swimming), even sight-seeing and tourism (think Niagara Falls). Water conservation and reuse strategies and technologies have advanced considerably in recent decades, and can be applied in all water use sectors. They include water metering, drip irrigation, low-flush toilets and low-flow showerheads, lawn watering restrictions, xeriscaping (using drought-tolerant plants adapted to arid environments for landscaping), use of grey water for irrigation, and a host of others. With enough engineering and expense, we can literally cleanse our water "from toilet to tap". All of these methods and devices taken together are capable of reducing per capita water consumption to such an extent that many regions of the country could accommodate projected population growth and still have enough water both for humans and nature without major new water projects. However, in the driest and one of the most rapidly growing parts of the United States — the American Southwest – the same cannot be said. This arid region was formerly thinly populated, but it burst from just three million in 1900 to 45 million at present.28 The Southwest could soon be facing, in the words of New Mexico native Kathleene Parker, "twice the people, half the water".29 This region, served by two over-allocated, over-stressed rivers — the Colorado and the Rio Grande — is both extremely hot and dry, its large-scale settlement made possible only through the advent and spread of air conditioning. Witty cowboy humorist Will Rogers once quipped of the Rio Grande ("Big River" in Spanish) that it was "the only river I ever saw that needed irrigation." One of the largest municipal water districts in Texas is implementing state-of-art conservation-efficiency-reuse measures — reducing consumptive water use per capita by 20 percent or more — but because its population is projected to more than double in the coming 50 years, it has no choice but to embark on economically and ecologically expensive new dam, reservoir, and pipeline projects. After another disappointing 2014-2015 winter of anemic precipitation, California is now four years into the worst drought in its recorded history. Its Sierra snowpack and huge reservoirs are at unprecedented lows, and scientists are warning of the possibility of an incipient "megadrought" that could last decades. In March 2015, Governor Jerry Brown declared statewide mandatory water restrictions for the first time in California's history, ordering towns and cities to reduce their water use by 25 percent. Yet at the same time, California's governor is a gushing immigration enthusiast who eagerly welcomes any and all newcomers to his state, legal and illegal alike. Both in his earlier incarnation as "Governor Moonbeam" in the 1970s and his recent governorship, Brown enjoys prattling on about the imperative of embracing limits, except when it comes to population growth, about which he says nothing. But in the real world, the fact that California already has 39 million residents, and continues to add millions more every decade surely has some bearing on whether there is enough water to go around. For cornucopians of Brown's ilk, admitting that the problem may be more a "longage" of people than a shortage of water (in Garrett Hardin's memorable turn of phrase) is apparently beyond the pale. In a nutshell, water resources in America are already stressed in many parts of the country, and projected population growth will stress them further, though a commitment to good planning can buy time and alleviate some of that stress. One way stress will be relieved is buying farmers' water rights, which is happening in California and elsewhere. 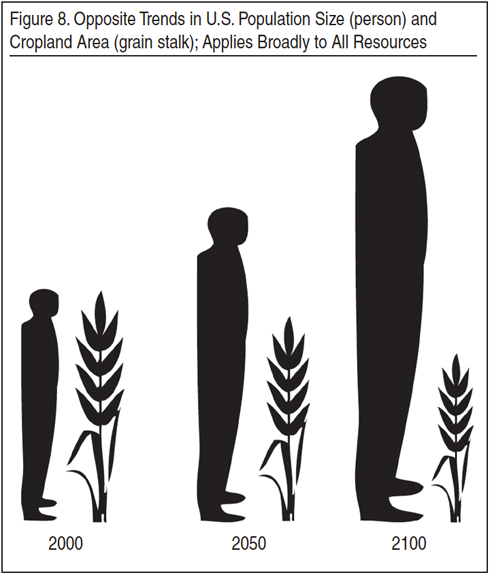 To accommodate the water demands of a growing population, we are reducing our ability to feed that population, and overseas populations that depend on our food (especially grain) exports. It's called "robbing Peter to pay Paul" or a zero-sum game, as opposed to "win-win," which is what Americans and everyone else prefers. People need a place to live. Every person lives in a home — whether an apartment, condo, townhouse, or single family dwelling — that takes up space that was once natural habitat. But everyone also uses other structures, facilities, and infrastructure that displace additional habitat as well, such as roads, parking lots, office buildings, shopping centers, recreation facilities, and schools. Yet all of these facilities occupy just a small portion of the overall land area that each person co-opts. Farmland, rangeland, timberland, and mines extend across large areas and are exploited to provide food, fiber, and minerals to each consumer. Most of the energy we use comes from oil and gas wells and coal mines that disturb or eliminate wildlife habitats. Pesticides, herbicides, and fertilizers are used heavily to provide the food we eat; the former can harm wildlife because of its toxicity, while the latter two can impair water quality and aquatic life. A notorious "dead zone" up to 6,000-7,000 square miles in area now appears every summer near the mouth of the Mississippi River in the Gulf of Mexico; this zone of severe hypoxia or oxygen deprivation is caused by the runoff of fertilizers (plant nutrients, primarily nitrogen and phosphorus) from farmland in the Mississippi watershed. Animal wastes and sewage contribute nitrogen and phosphorus as well. Nutrients cause algal blooms (i.e., algal population explosions) which, when the algae die en masse, deplete dissolved oxygen, upon which almost all aquatic and marine life depends. Increasing the U.S. population by 36 percent will severely exacerbate pressures on wildlife and wildlife habitat. Even if more people opt to reduce their per capita impact by living more compactly and recycling and eating less meat or no meat at all (which reduces the amount of land and water required to feed animals), about the best we could hope for voluntarily is to perhaps trim the increase in aggregate impacts down to 20 percent. In our most overpopulated and biologically diverse state, several years ago the California Department of Fish and Game counted more than 800 imperiled species, including half of all mammals and one-third of all birds.30 The department identified the major stressors affecting California's wildlife and habitats. It emphasized that: "Increasing needs for housing, services, transportation, and other infrastructure place ever-greater demands on the state's land, water, and other natural resources." Of course, all of these are a direct function of population size. Mass immigration is increasing America's population size and national EF, pushing our country deeper into ecological debt. 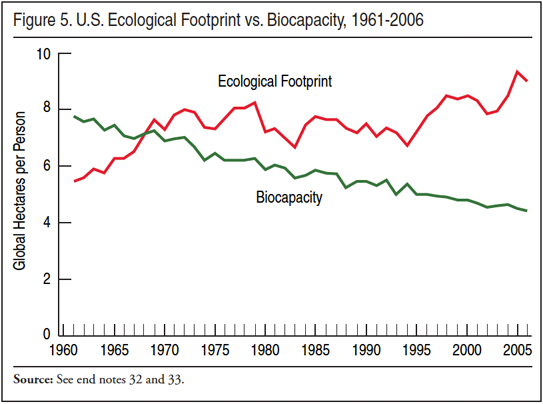 See Figure 5, in which our EF is estimated to have exceeded our biocapacity by the late 1960s. At over 320 million, U.S. population currently is well in excess of the carrying capacity of our land and resource base. If everyone in the world consumed resources like Americans, the ecological footprint would be 4.05 earths.33 High immigration levels that will drive our numbers to a projected 420 million by 2060 will only exacerbate this situation. Assuming the Census Bureau's official population projections for 2060 actually do happen, the U.S. population will be 36 percent larger than at present. 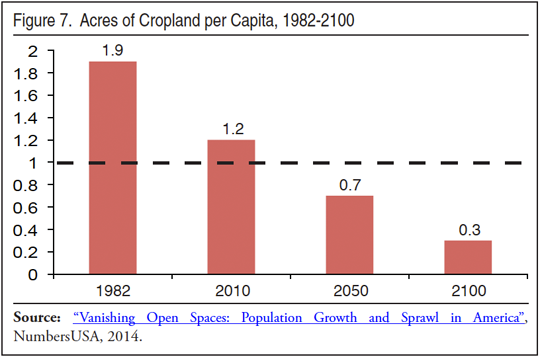 Even if there were no further increase in the U.S. per capita EF, which is, as can be seen from the 45-year trend in Figure 5, a rather generous assumption, a 36 percent increase in the U.S. population would correspond to a further 36 percent decrease in biocapacity per capita, even without continuing land and resource degradation. The 2012 U.S. EF was 17.8 global acres (GA) per capita and the biocapacity 9.5 GA per capita for an ecological deficit of 8.3 GA per capita. By 2060, if current U.S. demographic trends and projections hold, the biocapacity per person will have been reduced to 7 GA per capita. If the per capita EF remains at the 2012 value of 17.8 GA, the ecological deficit in 2060 will widen to 10.8 GA per capita. The Global Footprint Network conducts ongoing research on the EF and keeps track of individual country trends through its National Footprint Accounts. In a 2011 report, the network states that, "As resource pressures increase and our populations expand, countries compete with one another in an auction for Earth's limited biocapacity. "34 In allowing its population to expand by another 36 percent, the United States only aggravates the plight of the planet and its inhabitants. A series of studies conducted by Kolankiewicz, Beck, and Camarota in the early 2000s, and resumed by Kolankiewicz, Beck, and Manetas in 2014, has quantified the role of population growth in driving urban sprawl, and trends in this role over time.35 Using data and surveys compiled painstakingly over several decades by the Census Bureau and the Natural Resources Conservation Service (NRCS) of the U.S. Department of Agriculture, the sprawl studies in the early 2000s — covering the last three decades of the 20th century (1970-2000) — documented that population growth accounted for about half of sprawl, with decreasing population density (or conversely, increasing per capita land consumption) accounting for the other half. The role of population growth in driving sprawl was highest in the urban and developed areas of the West, South, and Southwest, the regions of the country that are growing the fastest now and that are projected to continue growing the fastest for decades to come. The studies in the early 2000s revealed some ominous trends. In the 15 years from 1982 to 1997, America converted approximately 25 million acres (39,000 square miles) of rural land — forests, rangeland, pastures, and cropland — to developed land, that is, to subdivisions, freeways, factories, strip malls, airports, and the like. That was an area about equal to Maine and New Hampshire combined. These losses occurred at an average rate of 1.7 million acres per year, 17 million acres per decade. If this rate of 17 million acres per decade were to continue to 2060, which is consistent with the Census projections, the United States will have lost an additional 107 million acres of rural countryside. That's 167,000 square miles, about equal to the combined areas of Connecticut, Massachusetts, Rhode Island, Vermont, Delaware, Pennsylvania, New York, New Jersey, and Virginia. Added to the loss of an area equivalent to Maine and New Hampshire from 1982-1997, that amounts to much of the Eastern Seaboard. Anyone who has ever flown at night from New York to Florida and seen the galaxies of twinkling lights below sweeping to the horizon and beyond gets a feel for how far advanced this process of mass urbanization already is. The future will see more of the same if U.S. population grows by 36 percent, barring a marked change in where and how Americans choose (or are forced, as by higher gasoline/energy prices) to live. In an earlier study, it was found that greenhouse gas emissions in the United States from fossil fuel combustion grew by almost 13 percent from 1990 to 2000. U.S. population grew by almost an identical amount — slightly over 13 percent in the same decade. Thus, the increase in greenhouse gas emissions closely matched the increase in population.38 Put a different way, the growth in aggregate emissions was driven entirely by population growth, not growth in per capita emissions. Because CO2 emissions are a direct result of fossil fuel combustion, which represents 85 percent of our energy consumption, the predictions above for energy consumption are also germane to CO2 emissions. With projected population growth of 36 percent by 2060, and moderate economic growth, but at the same time with declining per capita energy use and declining energy intensity (energy per dollar of GDP), it is reasonable to suggest that aggregate American CO2 emissions will rise by about 20 percent (one-fifth) by 2060. Two important caveats must be made about this estimate. First, CO2 emissions from the United States are already enormous, accounting for roughly one-sixth of the world total. Second, this estimate assumes no change in the mix of our energy technologies, that is, no significant shift away from the carbon-intensive fossil fuels toward renewables and nuclear power for electricity generation and little penetration of all-electric vehicles in the market. If a serious push were made toward these alternative technologies and further improvements in energy efficiency, the predicted increase in U.S. CO2 emissions might be reduced or avoided, but this would require far greater national resolve than witnessed to date. Nevertheless, this is in the context of a call by climate scientists and activists for reductions in the GHG emissions of industrialized nations by 70-80 percent by the middle of this century to lessen the risk of dangerous climate destabilization.41 Merely reducing the rate of increase falls far short of the drastic reductions advocated; with a projected U.S. population increase of 36 percent by 2060, any such reductions seem unrealistic. Adding another 111 million resource consumers to America's population by 2060 will have other adverse effects on the American landscape and environment in addition to those described above. These are depicted by the schematic in Figure 8. The table of contents of a typical Environmental Impact Statement (EIS) prepared under the National Environmental Policy Act (NEPA) includes topics such as soils, air quality, vegetation, noise, recreation, visual resources (aesthetics), cultural and historic resources, waste management (including hazardous and toxic wastes), and environmental justice. A substantially larger population extracting more resources from the environment and extruding more residuals into the environment will adversely impact all of these. In spite of their common-sense logic and the respectable political pedigree of those making these calls for a halt to U.S. population growth, they have largely been ignored, sometimes scoffed at, for more than 40 years. In these four decades, the U.S. population has grown 50 percent — by over 100 million — and pressures on the environment have increased more or less at a commensurate pace. Now over the next five decades, the Census Bureau is projecting that America's numbers will swell by yet another 36 percent and high levels of immigration are the primary driver. In 2060, if Americans acquiesce to this fate, and barring one or more of the black swans or tipping points discussed earlier, the U.S. population will still be growing very rapidly. The Census projections show it will be increasing by two million people at the end of 2050s. An ever-larger population cannot help but move the country ever further away from the goal of environmental sustainability. 1 Mineral Information Institute. 2012. Per Capita Use. Every year — 38,052 lbs. of new minerals must be provided for every person in the United States to make the things we use every day, including: 8,148 lbs. of stone; 5,775 lbs. of sand and gravel; 11 lbs. of lead; 7 lbs. of zinc; 37 lbs. of soda ash; 6 lbs. of manganese; 372 lbs. of other nonmetals, and 25 lbs. of other metals. The annual per capita energy consumption of each American is provided by 951 gallons of oil, 6,439 lbs. of coal, 80,905 cubic feet of natural gas, and 0.25 lbs. of uranium. 2 G. Vince. 2011. "An Epoch Debate". Science 334 (6052):32-37. 3 Butchart, Stuart, et al. 2010. "Global Biodiversity: Indicators of Recent Declines". Science 328 (5982): 1164– 1168. 5 Steven A. Camarota and Karen Zeigler. 2009. "A Shifting Tide: Recent Trends in the Illegal Immigrant Population". Center for Immigration Studies; Steven A. Camarota and Karen Zeigler. 2008. "Homeward Bound: Recent Immigration Enforcement and the Decline in the Illegal Alien Population". Center for Immigration Studies; Jeffrey Passel, D'Vera Cohn, and Ana Gonzalez-Barrera. 2012. "Net Migration from Mexico Falls to Zero — and Perhaps Less". Pew Hispanic Center. 6 See Table 1 in the December 2012 Census Bureau Projection, which shows a total U.S. population of 420.3 million in 2060. In prior projections, the Center for Immigration Studies has estimated a U.S. population of 338.3 million in 2060 assuming no net immigration after 2060. Also see Table A1 in the CIS projections. Thus immigration by itself will add roughly 82 million residents to the U.S. population (420.3 minus 338.3.) While 82 million may seem like a large number, the new Census Bureau projections show net immigration (the difference between people coming and going) will total 51.1 million from 2015 to 2060 and this figure does not include the children and grandchildren these future immigrants will have once in the country. 7 Steven Camarota. 2012. "Projecting the Impact of Immigration on the Size and Age Structure of the American Population in the 21st Century". Center for Immigration Studies. 8 Nassim Nicholas Taleb. 2007. The Black Swan, New York: Random House. 9 Donella H. Meadows, Dennis L. Meadows, Jørgen Randers, and William Behrens III. 1972. The Limits to Growth. Universe Books. 10 Debora MacKenzie. 2008. "Why the demise of civilisation may be inevitable". New Scientist. 11 Joseph Tainter. 1988. The Collapse of Complex Societies. Cambridge University Press. 12 Robert Sanders. 2012. "Scientists uncover evidence of impending tipping point for Earth". UC Berkeley News Center. Anthony D. Barnosky, et al. 2012. "Approaching a state shift in Earth's biosphere". Nature 486: 52-58. 13 Association for the Study of Peak Oil and Gas-USA. As shown by recent low prices of crude oil, gasoline, and natural gas, the advent of "tight oil" and shale gas derived from hydraulic fracturing (hydro-fracking or just "fracking") of geologic shale formations in the United States like the Haynesville, Marcellus, Eagle Ford, and Bakken, as well as from unconventional sources like the Athabasca tar sands in the Canadian province of Alberta, have delayed the global peak production of "all liquid hydrocarbons" by a matter of years or decades. 14 See 350.org, Think Progress, and the Intergovernmental Panel on Climate Change (IPCC). 15 Christopher O. Clugston. 2012. Scarcity: Humanity's Final Chapter? Booklocker.com, Inc. Port Charlotte, Fla. Chris Clugston. 2012. "Geo Scarcity: Geo Destinies in the Coming Age". Presentation at the 2012 Social Contract Writers Workshop in Washington, D.C. See also, "America the Vulnerable! The impact of depleting Earth's nonrenewable natural resources (NNRs)" . The Social Contract, Vol. 25, No. 2, Winter 2015. 17 See the Post Carbon Institute website. 18 Texas Transportation Institute. 2011. 2011 Urban Mobility Report and Appendices. 20 U.S. DOE Energy Information Administration (EIA). 2012. Annual Energy Outlook 2012. 21 EIA. 2012. 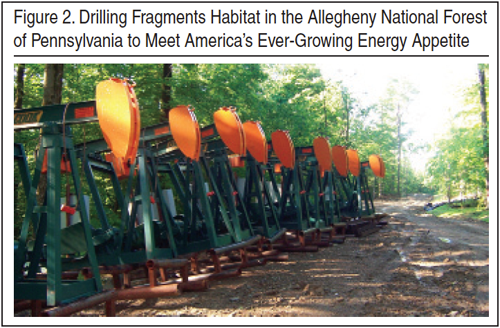 "U.S. Crude Oil, Natural Gas, and Dry Exploratory and Developmental Wells Drilled". 22 EIA. 2010. "United States Total 2009 Distribution of Wells by Production Rate Bracket". 23 Chris Nelder. 2012. Abstract of paper entitled, "The Future of Fossil Fuels: A Century of Abundance or a Century of Decline?" presented to American Geophysical Union 45th Annual Fall Meeting, 6 December 2012, San Francisco, Calif..
24 U.S. Government Accountability Office (GAO). 2012. "Unconventional Oil and Gas Production: Opportunities and Challenges of Oil Shale Development". Testimony of Anu K. Mittal, Director, Natural Resources and Environment, GAO, before the Subcommittee on Energy and Environment, Committee on Science, Space and Technology, House of Representatives. May 12. 25 Walter Youngquist. 1997. Geodestinies: The inevitable control of Earth resources over nations and individuals. Natl Book Co.
26 N.L. Barber. 2009, Summary of estimated water use in the United States in 2005: U.S. Geological Survey Fact Sheet 2009–3098, p. 2. 27 David Pimentel, et al. 2004. "Water Resources, Agriculture, and the Environment". Report 04-1, College of Agriculture and Life Sciences, Cornell University. July. 28 Kathleene Parker. 2012. "The Southwest: Ground-Zero for Global Warming". NPG Forum Paper. See also, Kathleene Parker. 2010. "Population, Immigration, and the Drying of the American Southwest". Center for Immigration Studies. 30 California Department of Fish and Game. 2007. California Wildlife Action Plan. California Wildlife: Conservation Challenges. 31 Global Footprint Network. 2011. "2011 Annual Report: What happens when an infinite-growth economy runs into a finite planet?" 32 Leon Kolankiewicz. 2010. "From Big to Bigger: How Mass Immigration and Population Growth Have Exacerbated America's Ecological Footprint". Progressives for Immigration Reform. March. 33 Global Footprint Network. 2012. "Country Trends – United States of America". 34 Global Footprint Network. 2011. "2011 Annual Report: What happens when an infinite-growth economy runs into a finite planet?" 35 Leon Kolankiewicz and Roy Beck. 2001. Weighing Sprawl Factors in Large U.S. Cities: A report on the nearly equal roles played by population growth and land use choices in the loss of farmland and natural habitat to urbanization. NumbersUSA. Roy Beck, Leon Kolankiewicz, Steven A. Camarota. 2003. Outsmarting Smart Growth: Population Growth, Immigration, and the Problem of Sprawl. Center for Immigration Studies. Leon Kolankiewicz and Roy Beck. 2000. "Sprawl in California"; Leon Kolankiewicz and Roy Beck. 2000. "Overpopulation = Sprawl in Florida". Arlington, VA: NumbersUSA; Leon Kolankiewicz and Roy Beck. 2003. "Population Growth and Sprawl in the Chesapeake Bay Watershed"; "Leon Kolankiewicz, Roy Beck, and Anne Manetas. 2014. 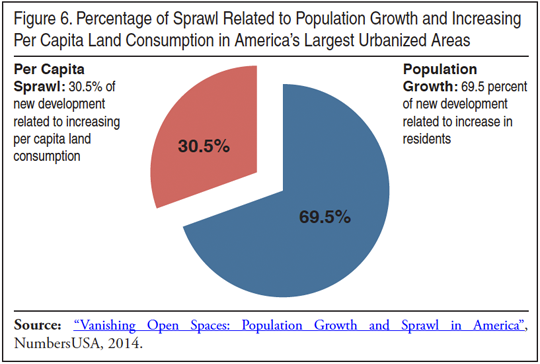 "Vanishing Open Spaces: Population growth and sprawl in America"; Leon Kolankiewicz, Roy Beck, and Anne Manetas. 2015. "Vanishing Open Spaces in Florida: Population growth and sprawl in the Sunshine State". 36 Committee on the Science of Climate Change, National Research Council, National Academy of Sciences. 2001. Climate Change Science: An Analysis of Some Key Questions. National Academies Press: Washington, D.C.. Intergovernmental Panel on Climate Change (IPCC). 2007. Climate Change 2007: The Physical Science Basis — Summary for Policymakers. Contribution of Working Group I to the Fourth Assessment Report of the Intergovernmental Panel on Climate Change. Cambridge University Press: Cambridge, UK; World Bank. 2012. Turn Down the Heat: Why a 4º Warmer World Must Be Avoided. 37 National Oceanic and Atmospheric Administration (NOAA), Pacific Marine Environmental Laboratory Carbon Group. No date. "Ocean Acidification: The Other Carbon Dioxide Problem". 38 Leon Kolankiewicz. 2003. "Population Growth — The Neglected Dimension of America's Persistent Energy/Environmental Problems". 39 U.S. Environmental Protection Agency. 2012. "Greenhouse Gas Emissions". 40 U.S. Department of State. 2007. Fourth Climate Action Report to the UN Framework on Climate Change: Projected Greenhouse Gas Emissions. 41 Union of Concerned Scientists. 2007. A Target for U.S. Emissions Reductions. 42 The Rockefeller Commission. 1972. Population and the American Future: The Report of The Commission on Population Growth and the American Future. 43 President's Council on Sustainable Development. 1996. Population and Consumption Task Force Report.